The largest C-Type Hydraulic Swaging Machine in Europe is dispatched ! 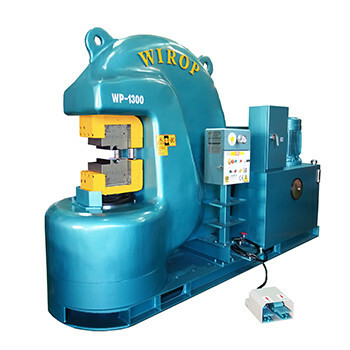 In June 2018, Wirop Industrial Co., Ltd. (Wirop) has completed the machine production of the largest C-Frame (C-Type) Hydraulic Swaging Machine in Europe market: WP-1300C-New shape. “WP-1300C-New shape” has good looking shape, new design, and numbers of great features to meet clients’ needs while doing the swaging works. “WP-1300C-New shape” is going to ship to Germany in July 2018. In the past, Wirop has manufactured 2 testing machines with large capacity to Europe market: One “600 MT Test Bench -Push on Pull” shipped to Germany in June 2017, and one “800 MT Test Bench -Push on Pull” shipped to Spain in March 2018. Wirop Industrial Co., Ltd. (Wirop) was established in 1979 and was the first company to manufacture the swaging machine in Taiwan. Wirop sold one WP-1300C to the client in the Netherlands in 2011, but we keep improving every stage of manufacturing process, and keep producing machines with greater functions to serve our customers and those of the wire rope industry. Please visit our website or e-mail us for more details: : WP-1300C-New shape.